I spent most of Toronto Fashion Week at the library, immersed in history research, but I did emerge briefly to take in the dreamfest that was Renata Morales. 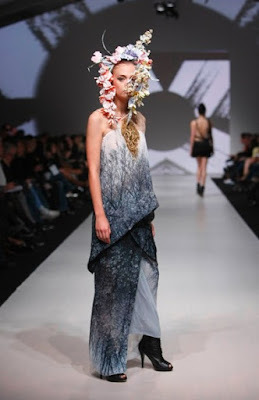 For spring 09, the Mexican born, Montreal based designer was heavily influenced by Japan, a place that seems to be the current obsession of every designer/artist/travelling blogger I've encountered this fall... I can hardly wait to visit Tokyo this winter. The chiffon dresses that dominated Morales' collection were painstakingly swirled, ruched and braided, often descending into skirts of origami-like pleats, putting me in mind of Sophia Kokosalaki's work. The colours ranged in soft pastels for the most part, with one or two black and red versions in between. The floatiness of the pale dresses was grounded by black leather ankle boots and theatrical floral headpieces (purchased, apparently from a dollar store and spray painted - something I must try). 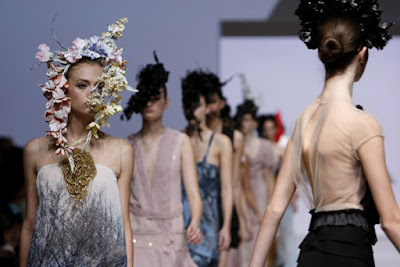 Also included were long, flowing gowns and caftans in homage to pop artist Yoshitomo Nara, which featured muted, glimmering sequins and his popular "evil child" faces. 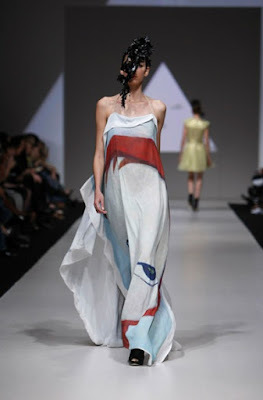 The most inspiring part of the collection for me was a series of drop waisted chiffon dresses, printed in large scale with images Morales had taken on her travels. Buildings in Belgrade and Japanese sakura blossoms worked particularly well. 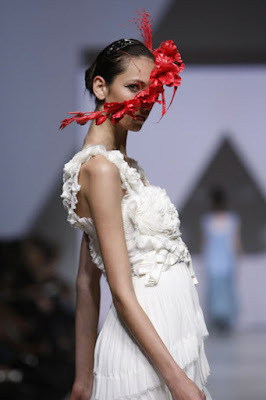 Posted by la femme at 12:10 p.m.
so couture i love it! i love that you like to travel, so you do what you must to make it happen. stunning designs, love your blog! Those photographs really are amazing. There is so much inspiration all around. I haven't seen her stuff before - great designs. Wow,Great picture i more like this! Wow, I actually really love the head pieces! Not that I would wear one in public lol but on the models they look very pretty! Wow the models and dresses are really beautiful.